How To Make Chocolate: Learn to Make it From Scratch at Home! 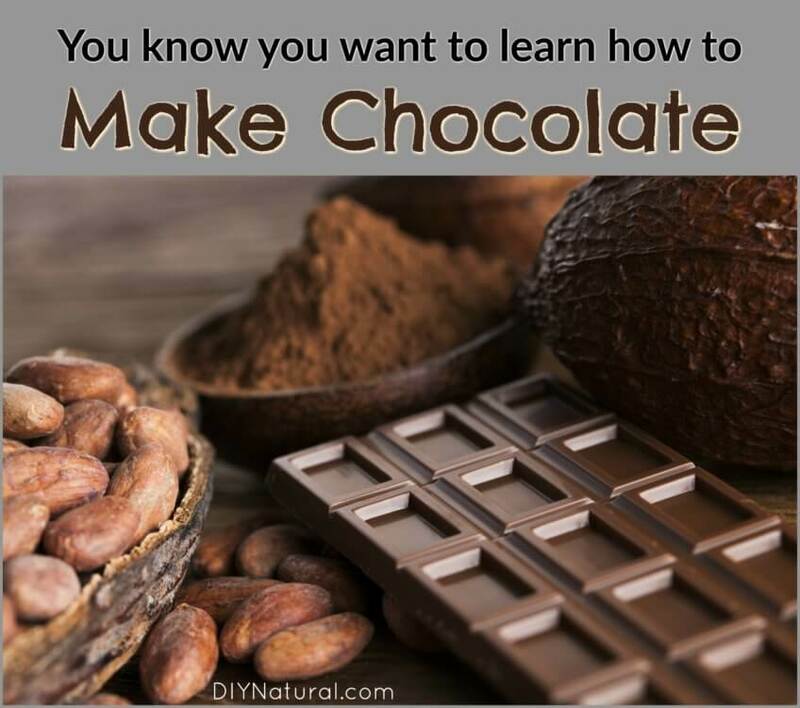 Home DIY Natural Blog Food Learn How To Make Chocolate From Scratch! It’s one of the most sought after foods on earth! It comes in liquid, bars, bites, even liquor. But it is also one of the most adulterated foods we consume. To avoid all sorts of questionable ingredients, I recommend experimenting to come up with your favorites. If you purchased roasted beans, you can skip this step. If you have raw beans, you’ll want to roast them before grinding them. Roasting beans is very easy, but you’ll need to keep an eye on them or they may burn. Spread beans on a cookie sheet lined with parchment paper (to make cleanup easier). Roast beans at 400°F for about 5 minutes. Listen for the first “crack,” similar to roasting your own coffee. This cracking is what helps separate the bean from the shell. After the first cracks are heard, turn the oven down to 250°F and roast an additional 5-10 minutes. Cool and go to the next step. NOTE: You may need to crack the beans with a hammer or crush with a sturdy pan before you move on to winnowing. Similar to winnowing grains, this is done to remove the shell. Place the beans in a shallow bowl and toss them in the air, catching them as they fall. It’s helpful to have a breeze or a fan to help remove the chaff. WARNING for pet owners: The bean shell can still contain some theobromine, the substance in chocolate that can make dogs (and some cats) sick. Keep animals in another room until all shells have been cleaned up. The next step can be the most difficult part. You can use a coffee grinder for the first part, but once the paste starts to form, you may need to switch devices. (Some coffee grinders are ok with liquids, but some are only for dry ingredients. Refer to the instruction manual for your appliance.) A food processor or high speed blender can also be used. Start with a small amount and grind as finely as possible. The finer the grind, the more flavor the bean releases. Note: This was my favorite part of learning how to make chocolate! At this time you can add other ingredients. Sugar is the most common, as dark chocolate can be bitter on its own. If you don’t want sugar, you can use stevia, monkfruit, or another dry alternative. You can also add things like candied orange peel, cayenne, salt, or dried berries. Anything dry can be added without a problem. Avoid liquid ingredients like maple syrup, honey, or agave. This can cause the mix to be gooey or cause crystals to form. Once dry ingredients are added to the mix, grind until a paste forms. You may need to add a little melted cocoa butter (find it here). Keep grinding until it gets really smooth. If the texture is not changing while grinding, you can switch to a mortar and pestle. This process is known as “conching” and gives you the smoothest finish. If your appliance heats up, you can stop for a few minutes and then continue once it cools. Tempering the chocolate is an optional step, but produces better results. Have you ever bought a chocolate bar that looks dusty or moldy? It’s not mold you are seeing, but cocoa butter that has separated out of the bar and collected on the surface. There is nothing wrong with this, but it can cause the bar to taste waxy. Cocoa butter in itself can have a very waxy feel to it. To avoid this cocoa butter separation, you can temper your chocolate. Place your ground chocolate in a bowl and place over a pot of boiling water, creating a makeshift double boiler. Bring the melted chocolate to about 110°F and remove from heat. Next, using a stainless steel whisk, begin to “pull” the chocolate out of the bowl. Raise the whisk until the chocolate on it dribbles back into the bowl. Keep the chocolate moving until it gets very thick and fudge-like. At this point the chocolate is ready to be poured into molds. Place molds on a flat surface and pour chocolate into desired molds. If you wish to have fillings in your bars, you can pour half the bar, add your fillings, like caramel or creme, then pour the other half. I prefer to let my chocolates harden naturally, but you can put them in the refrigerator or freezer if you wish. Just be aware that if you haven’t tempered your chocolate, you may get the cocoa butter on the outside as described above. Interested in learning how to make chocolate, but don’t have time to make it from scratch? Learning how to make chocolate from scratch was a lot of fun for me! If you make it, tell us how it turned out.